The royal wedding of Prince Harry and American actress Meghan Markle took the world by storm. If you're anything like us here at California Wedding Day, you probably had some serious royal wedding fever, and it's safe to say that the occasion did not disappoint in the slightest. Here are some of our favorite moments of the wedding of Prince Harry and his bride Meghan, The Duke and Duchess of Sussex. The bride stunned in a beautiful gown by Clare Waight Keller for Givenchy and the incredible Queen Mary Bandeau tiara, which was made in 1932. Markle wowed in a 16-foot silk tulle veil with an embroidered floral trim representing each of the 53 countries in the English Commonwealth. 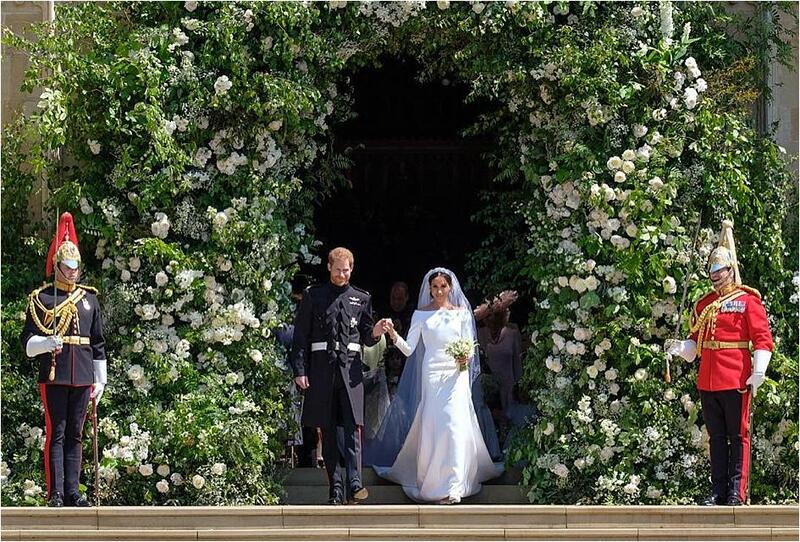 The beautiful understated bouquet included forget-me-nots, the favorite flower of the late Princess Diana, and were handpicked from the garden at Kensington Palace by Prince Harry. The pair recited their vows during a traditional yet groundbreaking ceremony at St. George's Chapel at Windsor Castle. The event showcased each and every regal tradition, yet highlighted some unique American touches to bring the bride's personal style to the affair. Claire Ptak of Violet's Bakery was given the honor of creating the royal wedding cake, a gorgeous lemon and elderflower confection adorned in amazing florals including garden roses, peonies and foxgloves. Among our favorite details included the breathtaking floral design gracing the entrance to the St. George's Chapel and the bride's absolutely gorgeous Stella McCartney reception gown that was paired with a stunning aquamarine ring once belonging to Harry's mother. It's #RoyalWedding Day! Follow the link in our bio to watch live. Today it has been announced by @TheRoyalFamily that Prince Harry and Ms. Meghan Markle will become Their Royal Highnesses The Duke and Duchess of Sussex. With winter sneaking up right around the corner, we're gathering our winter wedding inspiration from this dusty blue styled shoot. Popular photo booth rental company 321 FOTO recently launched its first stand-alone camera to provide a more flexible photo booth option for venues that can’t accommodate a classic, sit-in booth. From the first look to the last kiss, weddings are filled with many beautiful and touching moments.